Weddings are such a special occasion for all. However, the bride is the centre of attention and all eyes are on her. A happy and a stress-free bride can carry off any look. Most brides really stress out about their hairstyles. With traditional weddings, the bride has the option to go with a ‘juda’ or traditional braids with flowers. However the trend is changing and brides want to sport different looks for various wedding functions. Some trends for 2014 that brides are more comfortable in sporting are as follows. You may notice that the styles are more relaxed and easy to maintain during the wedding festivities. The no hassle look is in tune with the modern bride’s sensibilities as she does want to enjoy her own party! A daily part of “shringar” in the 70’s, the flower has made a comeback in weddings. Not only do flowers add freshness to the looks of the bride, the smell of roses, mongra and others act like an aroma therapy for the bride. Also, many are leaving behind tight buns and letting their hair lose. One accessory that lifts the look of the hairstyle is the flower. Bollywood stars such as Genelia D’Souza, Aishwarya Rai did not skip this part of a traditional bride shringar. Having a clean look with or without accessories is possible. 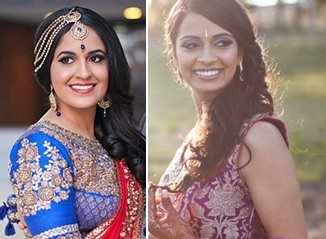 Brides opt for such looks as their bridal makeup and attire are heavier. Thus, makeup and hair needs to look as natural and comfortable as possible. The below looks are of two beautiful brides for their wedding reception. 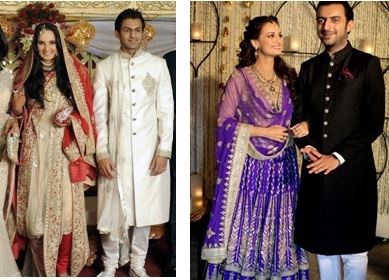 For more natural looks get inspired by Diya Mirza’s recent pictures on her pre wedding function. ‘Chunnis’ cover the head of the Indian bride and supporting the long drape is the bun which gives the bride’s look length and sophistication. There are different types of hair buns for the traditional Indian bride. There is the high, mid and low hair bun. The buns can be plain looking or be accessorized. Also the buns can be layered with braids and curls. The bun can be placed at the side of the nape or in the centre. Noteworthy mentions are Aishwarya Rai on her wedding day and Genelia D’Souza. The humble braid is the choice of many an Indian bride. Not only it is simple but is elegant and comfortable. A traditional hairstyle of mostly the South Indian brides, it can be decorated with flowers and pretty jewellery. This is a hairstyle that will never go out of trend. It will always stay in the good books of the South Indian and a Sikh bride. To give volume and a new look to the plain buns, the braided buns are a way out. The French braid, the plain braid and others are now not only rocking the red carpet but also looks of brides. Be it on any occasion during the wedding festivities or on the main day itself. The braided buns are of many different types and your hairstylist can show you styles in a couple of days prior to your wedding. You may decide on the trendier braided buns to look your best on your day. Many brides are also letting down their tresses instead of pinning them up. Have the ends straightened or curled so that the length of your hair frames your face. It’s such a classy way of showing off a bride’s youth and beauty. Both Sania Mirza and Diya Mirza have sported the loose tresses look. Also they do look stunning! Marriages that happen in Bollywood inspire other Indian brides. They generally tend to stick to traditional dresses and jewellery. Hairstyle complements the bridal outfit. If you do not want to experiment with different looks on your wedding day, then you can chose to go the traditional way. You can go all out traditional even if you don’t want to follow the trend for 2014! These are evergreen looks any bride can pull off with aplomb! To all the brides who have been wondering how to look gorgeous on their wedding day – the trends are pretty simple to follow and we suggest you experiment with much in advance. Look the gorgeous you on your wedding day and do not forget to take with you your pretty smiles! ← Poll Tuesdays #6 – Which lip gloss color should you wear?